Have you ever experienced a devastating setback in your life? Maybe you have struggled in marriage or family; perhaps your finances have taken a catastrophic blow. All of us encounter difficulties that can be both painful and seemingly impossible to overcome. When your hopes and dreams have turned into a nightmare, it may seem that your life is over. But, God is in the business of resurrecting dead visions. It does not matter if your setback seems insurmountable; don't take a step back, because God has already prepared your comeback. 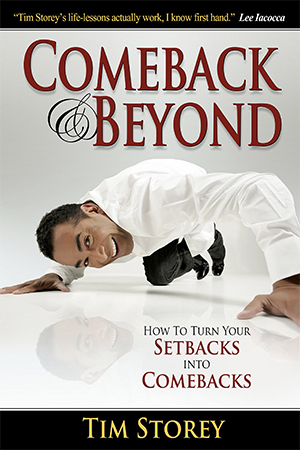 Comeback and Beyond, the book from acclaimed author, Tim Storey, has the answers, strategies, and motivation you must have to turn your tragedy into triumph. You will discover insights from the amazing turnarounds of some of the world's most prominent winners and the specific steps they took to experience a full-blown comeback, better and stronger than ever before. Get ready to experience new hope and a renewed passion for the ultimate life that God has meant for you. It s time for your comeback!